The Amethyst Biomat is an FDA Licensed Class II Medical Device. Due to the projection through amethyst crystals, the far infrared rays found in the Biomat penetrate deeper into the body than a regular sauna. How are Far Infrared Rays created in the Biomat? The method of generating Far Infrared Rays (FIR) through the Biomat is accomplished by sending pulses of energy (DC-Current) through a carbon ceramic material called the Japanese Kurera's Super Fiber. As the (FIR) passes through the Amethyst crystals, the crystals emit Long Wave Far Infrared Rays (8-12 microns) that penetrate 6-8 inches deep through the body. Therefore, the rays not only benefit the muscles on the surface of the body, but also all the cells, including blood vessels, lymph glands, and nerves in the deepest parts of the body. What are Far Infrared Rays and where do they come from? Far Infrared technology was first brought to us by nature herself. All living beings emit certain amounts of (FIR). Traditionally, we've gotten our daily dose of (FIR) from sunlight, which is composed of all the energy wavelengths in the electromagnetic spectrum. Far Infrared Rays are a form of energy that are part of the electromagnetic light frequency of sunlight that is not visible to the human eye. These Far Infrared Rays are safe, gentle, and beneficial - unlike the damaging effects of short wavelengths such as gamma rays and X-rays. NASA discovered how to generate (FIR) in the 1960's to keep astronauts healthy in space. Far Infrared Rays are the safest and most beneficial electromagnetic energy available to the human body. What are the health benefits of Far Infrared Rays? Far Infrared Rays relieve pain and stress by expanding blood vessels and increasing circulation. Better circulation allows more oxygen to reach injured areas of the body, helps reduce pain, and speed up the healing process. The (FIR) light not only benefit the muscles on the surface of the body, but also at a cellular level, including the blood vessels, lymph glands, and nerves in the deepest parts of the body. These rays vitalize the biological function of our cells and relieve neuralgia, backache, and arthritis pain, as well as help eliminate toxins and carbon dioxide from our blood. In addition, far infrared wave treatments have been used for cancer, chronic pain, stress, numbness, joint pain, rheumatism, low blood pressure, diabetes, and asthma. The Far Infrared wave speeds up cellular metabolic processes, stimulating the activity of mitochondria, and triggering enzyme activity as well as the healing regeneration and normalization of damaged cell tissue. Also, far infrared light waves are essential for bone growth as well as preventing osteoporosis. Dr. George Brainard found that light affects the hormonal balance of the body, in the levels of melatonin, prolactin, cortisone, testosterone, and thyroid hormones, and that light is essential to the functioning of our entire endocrine system. Far Infrared Rays promote vasodilation, bringing nutrients and oxygen to soft tissue regions, stimulating the removal of toxins, and decreasing inflammation and edema from the soft tissue. Detoxification strengthens the immune system, revitalizes skin tone, and helps normalize eczema and acne. Additionally, far infrared rays help reduce muscle spasm through heat, and reduce swelling, inflammation, and soreness through direct action on both free nerve endings and peripheral nerves. Other benefits include improving the balance of the blood pressure and blood sugar. You can safely get a full cardio workout and burn up to 600 calories in 30 minutes with the Biomat. It is perfect for those who are disabled or not well enough to get the daily exercise needed to stay healthy. Perspiring is part of the complex thermoregulatory process of the body that increases the heart rate, cardio output, and metabolic rate. The process requires a large amount of energy and reduces excess moisture, salt, and subcutaneous fat. Fat becomes water soluble at 110 degrees Fahrenheit, and the body sweats out fats and toxins. 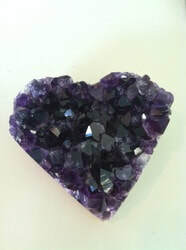 The Biomat is further enhanced with amethyst crystals, known for their calming and healing effects since ancient times. Amethyst crystal has come to be known as a power crystal with prolific healing powers that can be characterized as purifying, pacifying, and transitional. Known for its power to detoxify the body from alcohol and other harmful elements, amethyst also naturally produces far infrared rays. These rays revitalize the biological function of our cells to relieve neuralgia, backaches, and arthritis. Amethyst has been deemed as "nature's tranquilizer" by many health practitioners because of its effectiveness in relaxing not only the mind, but also the nervous system. The Amethyst Effect was scientifically demonstrated through spectral analysis, which demonstrated a change in infrared light when refracted through amethyst crystals. Scientists experimented with passing far infrared rays through a variety of substances, including various gems, glasses, and plastics. Amethyst was found to be the only substance which clearly changed the spectrum of infrared light. Wave forms mimicked patterns similar to the human voice, according to scientists. While no theory has been proposed regarding the Amethyst Effect, scientists hypothesize that the infrared light passed through the amethyst releases over 20 million years of information which is made available to the human body for healing purposes. The field of Far Infrared Crystallography explains this effect in further detail. Far Infrared Rays refracted through amethyst crystals organize the light into geometrical patterns with higher bio-compatibility. Korean researchers propose that the addition of amethyst in the Biomat allows for greater increase in the utilization of the beneficial far infrared light by the human organism. How are Negative Ions created in the Biomat? The Biomat features the Kurera Super Fiber from Japan. When the Kurera Super Fibers interact with DC energy, the potential field surrounding the material is converted into a negatively charged field. When 1000 volts of electricity are slowed down and converted into DC energy, the Kurera Super Fiber generates a discharge of Negative Ions into the air and converts positive ions into negative ions inside the body. When 600-1000 volts of negative potential is applied to your body, more calcium and sodium minerals are circulating in the blood stream. This process changes an acidified body to an alkaline body. Although it uses a high voltage, there in no danger because there is no current flowing. This device is sometimes called a static electric treatment or high potential device. What are Negative Ions and where do they come from? ​How does a Biomat compare to an electric heating pad? ​10 minutes. Only the skin surface is affected in the area. Kirlian photo of the body with the Biomat applied for 5 minutes. Skin is penetrated 80x more deeply than other kinds of heat. Because of this, it can warm the body from the inside out, and stimulate the system. 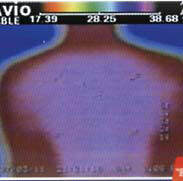 ​Kirlian photo of the body with the Biomat applied for 5 minutes. Skin is penetrated 80x more deeply than other kinds of heat. Because of this, it can warm the body from the inside out, and stimulate the system. ​The Biomat is safer than heating pads because there are no harmful electro-magnetic waves. Studies have shown that the use of common electric heating pads may cause carcinogenic cellular activity. ​​The Biomat is an electrical device - is it safe to lie on? Does it emit EMFs? 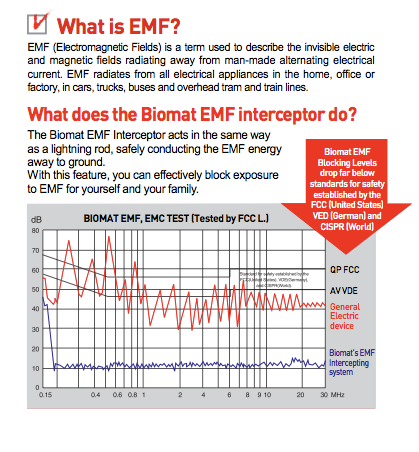 Some people worry about the correlation of Electro-Magnetic Field (EMF) frequencies and the Biomat. The Biomat is registered with the FDA as a medical device with 510k status. As such, the Biomat has been put through numerous safety and performance tests, including electro-magnetic field safety. Electro-magnetic frequencies naturally exist in many things, even infrared rays. What makes an EMF harmful is when the hertz level is less than one million. The infrared ray is 20 billion hertz which is not harmful. ​Since the Biomat is an electrical device,the manufacturer has incorporated a feature into the mats that blocks 100% of harmful EMFs caused by electricity. The Biomat is safer than heating pads because there are no harmful electro-magnetic waves. Studies have shown that the use of common electric heating pads may cause carcinogenic cellular activity. The Biomat uses remote computer frequencies that generate far infrared light-waves and negative ions. Heat is created through these natural, beneficial light-waves from vibratory signals, and conducted into the amethyst crystal bed via its high-tech messaging system. This advanced technology works without electric coils, and functions through a state-of-the-art Electromagnetic Wave Interceptor. The Biomat energetics penetrate 80 times more deeply than electric heat. 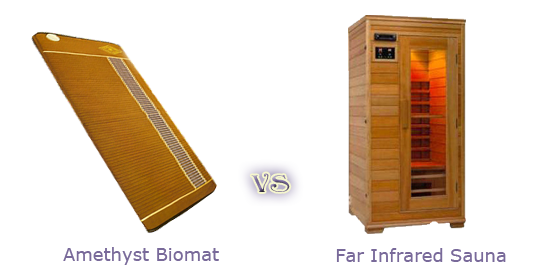 ​How does a Biomat compare to a far infrared sauna? They are some key advantages that the Amethyst Biomat has over a regular far infrared sauna that make it an excellent alternative. * The Biomat is more effective at delivering far infrared rays to the body. A typical far infrared sauna penetrates 2 inches into the body. A Biomat penetrates 6 - 8 inches through the entire body. *The Biomat is multi-functional. It serves as a far infrared sauna on the highest setting, but it can also be used at lower settings for a range of different therapeutic uses. * The far infrared delivered by the Biomat is more bio-available than a regular far infrared sauna because the far infrared projects through amethyst crystals. *The Biomat is not only a far infrared sauna - it combines high quality amethyst gemstones with the deeply relaxing component of negative ions, making it a triology of unique healing power with many benefits beyond a typical far infrared sauna. The negative ions generated by the Biomat stimulate serotonin and enter the body through conduction. To get that same effect in regular far infrared saunas, you need to pour water over hot rocks. * The Biomat is an FDA licensed medical device. Enjoy the luxury of Zero Gravity seating for whole body comfort during your Amethyst Biomat Session in our newly added Serenity Room. Enjoy your Biomat Session with Lavender Aromatherapy and Zero Gravity Recline. ​Sessions are 30, 45, 60, 75 or 90 minutes long and cost $1 per minute. ​to schedule your private Biomat session. *Legal Disclaimer. *These statements have not been evaluated by the Food and Drug Administration. Specific medical advice should be obtained from a licensed health care practitioner. *These products are not intended to diagnose, treat, cure or prevent any disease.